Kurukshetra University Recruitment 2019 - Apply Online for 198 Clerk Posts in Kurukshetra University, Kurukshetra, Haryana. Online Applications are invited by Kurukshetra University from 09 Apr 2019 to 15 May 2019 11:59 AM for 198 vacancies. The selection will be on the basis of Phase-I, II, III & IV (type test/ Test of Computer Appreciation and Application / Aptitude Test/ Physical document Verification). 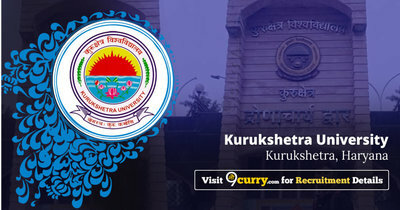 Eligible candidates may apply online at Kurukshetra University's website (direct link is given below) from 09 Apr 2019 to 15 May 2019 11:59 AM. Candidates log on to http://www.kuk.ac.in/.